Dateline: Three to six lines beneath the letterhead, flush left or right. The dateline contains the month (fully spelled out), day, and year. Greeting or salutation: One or two lines below the last line of the recipient’s address. If you use first names in person, you may do so in your salutation. Body: Starts one line below the greeting. The body of the letter contains whatever you have to say. Complimentary close: Two lines below the last line of the body of the letter, flush left or centered. All the following closes are appropriate in business letters when you don’t know the addressee: Yours truly, Very truly yours, Yours very truly, Sincerely, Yours sincerely, Sincerely yours. Signature: Immediately below your complimentary close, you hand-write your signature. Immediately below your handwritten signature, type your signature and business title. Final notations: Two lines below your typed signature. For example, if you’re sending copies of the letter to other people, you may type cc:, followed by the alphabetically listed names of those receiving the letter. 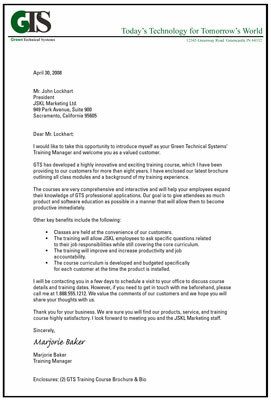 Check out an example of an appropriate business letter in this figure.